"CLOTHESlines" is an experience, not just a piece to be viewed. Time and space are integral to the work, which allows the work to become an extension of real life, a chance to connect with memories and feelings and expressions that the steady sound of a sprinkler can resurrect or the bright sounds a happy bird can bring to mind. It is a chance for the audience to feel as if they have been a part of something special, something bigger—not necessarily to feel as if it is new or different but to feel as if they are home. Two old and rusty chairs oversee the exhibition. A line filled with children's clothing including unmentionables. As a man just being diagnosed with bipolar disorder, this installation was poignant. The manic side of me was working full time as an art director, going to graduate school, a teaching assistantship, husband, and father of three, I realized I was missing my children growing up. 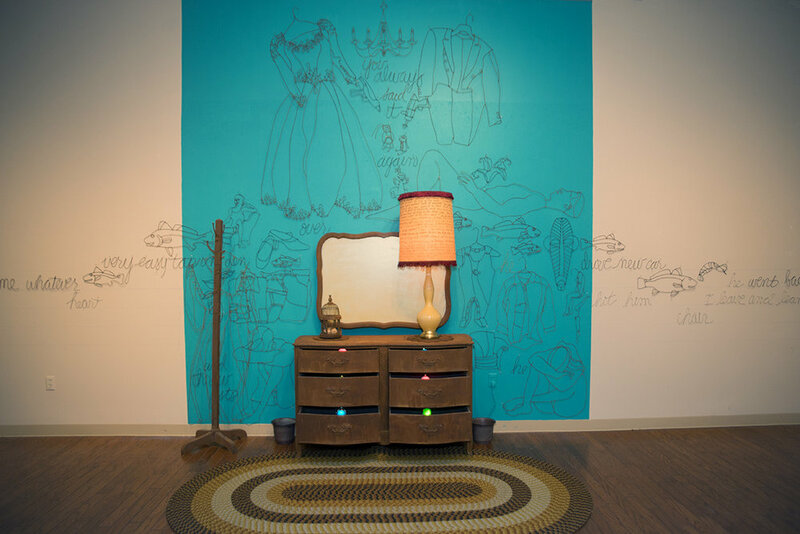 This was an installation from 6 years ago, my installation was a three-year investigation into the stories behind personal treasures that people sell inexpensively at garage sales. Since 1998, my installation work has always been based on the idea of a story. Whether these stories were from memories of growing up, family history, or shared with me—they were the reason behind what I created. There was safety in these stories, and if a viewer dug deep enough or long enough, they could find clues to understand my work. “It’s Time to Address’er Drawers” was first conceived after my mother passed away. When cleaning out the house, we discovered in her chest of drawers a stack of sealed envelopes, some addressed and others not. Inside were her journals that documented various disappointments in her life (including me! ), as well as revealing the tumultuous and abusive relationship between my parents. I decided it was time to acknowledge the abuse in some way, and installation was my best medium. 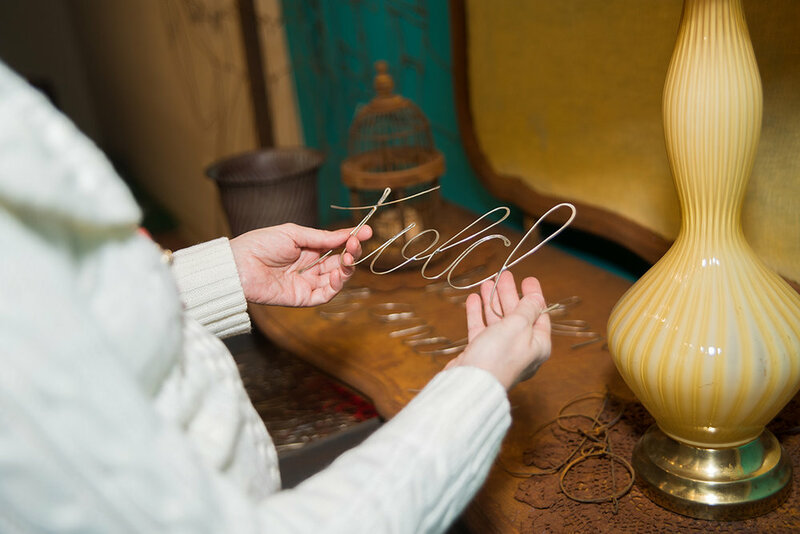 I chose one of the more dramatic "letters" and penned all the words out of silver wire. The words reside in the drawers of the actual chest that belonged to my parents. I rusted the chest inside and out and covered the mirror with a thin stained fabric in an attempt to hide the reflection from the viewer. The silver words were intended to sparkle with colored lights installed into the drawers. My intention was for the audience to pick up the words, handle them, sort through them, and co-participate by pinning them onto notebook paper-like lines that surrounded the room. By providing a hands-on opportunity, the words would become real, and in some ways, redemptive from the original intent. I used one of the lamps from my parents’ home and wrote all words so the audience could read the letter. The audience could touch the words, read them, as well as hear them continually through the recorded audio that accompanied the installation. For me, to acknowledge the abuse that I had often witnessed allowed myself to become a bit more sympathetic to my parents. Not by condoning it, but recognizing the roots of my depression. Knowing that my passive temperament grew out of the desire to hide from the hatred and abuse that I experienced growing up. 1. a whirling mass of air, especially one in the form of a visible column or spiral, as a tornado. 2. a feeling or situation that has so much power or influence over you that you feel you are not in control. Since 1998, my installation work has been based on the idea of a story. Whether these stories were from memories of growing up, family history, or those shared with me—there was always a reason behind what I created. There was safety in these stories, and if a viewer dug deep enough or long enough, they could still find clues to understand my work. Along with these stories was a personal vocabulary in the materials I used, which included wire and rust. The medium I used for over 19 years was baling wire, traditionally used to bind up, shut out, and fence in a family or homestead from the unknown, or in some ways, from actually being known. Having been someone who always dealt with depression, when I read Andrew Solomon’s book The Noonday Demon, I was enlightened to continue, “Mild depression is a gradual and sometimes permanent thing that undermines people the way rust weakens iron.” He went on to add, “If one imagines a soul of iron that weathers with grief and rusts with mild depression, then major depression is the startling collapse of a whole structure.” The reality was, I had allowed my Bipolar Disorder to rust my identity to the point of collapse. The original "Clothes-lines" installation was warm and sunny giving the feel and sounds of a summer day. Pictured here, is a 2006 version that took place in the fall. The original one had sod on the ground. People were seen having a picnic in the gallery and doing cartwheels. The first installation I did was called “Clothes-lines,” a day’s worth of laundry from our house. It also represented childhood memories of the rusted clothesline poles that spread across the backyard of many homes—with universal sound effects that defined the backyards which included a sprinkler, lawnmower, kids playing, dogs barking and birds chirping. Soon after I started to teach at JBU, I exhibited “Clothes-lines,” and I find it appropriate that I end with this updated version. With VORTEX, the sounds have been replaced by an impending tornado, as the wire drawings that have defined my art career are created to spin around the gallery in chaos. Pieces from "Clothes-lines", "One Body", "Immersion: the sign of Jonah" and "Garage Sale" installations were used for this installation. As I arrive at the actual point of retirement, I find myself both excited and petrified at the unknown and lack of control. Being an artist is such an honor, and something I have wanted to do since I was young. Always afraid to take the big step—now that I am doing it I am fighting the same fear, but have to trust that God has led me to this place. I metaphorically can see my past as pieces of art circle through the gallery—uncontrolled, unbridled, and unstoppable. With a world that can be defined by the same terms, I can only move on with my eyes on God. All items in the For Sale section is 15% off until December 31st! You're invited to attend the opening reception, Tuesday, November 14th of "Holiday Art Sale", Hosted by The Gallery at Midtown Associates, Bentonville, AR. Fun series of drawings based on shadows of my hands onto the paper. 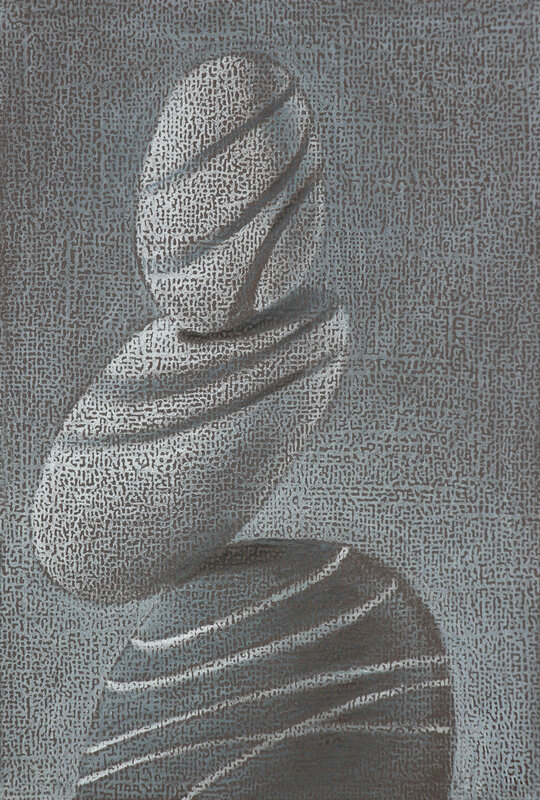 I brushed gel medium on the surface before using the colored pencil for a nice texture. They are small, but really fun. Bipolar Artist Blog was selected as one of the top 75 Fine Art blogs on the web. Joel Armstrong Fine Art was selected by Feedspot as one of the Top 75 Fine Art Photography Blogs on the web. American women entered the workforce in unprecedented numbers during World War II, as widespread male enlistment left gaping holes in the industrial labor force. Between 1940 and 1945, the female percentage of the U.S. workforce increased from 27 percent to nearly 37 percent, and by 1945 nearly one out of every four married women worked outside the home. “Rosie the Riveter,” star of a government campaign aimed at recruiting female workers for the munitions industry, became perhaps the most iconic image of working women during the war. My Show called RUSTED will be opening. Stage EIghteen, the greatest venue in Fayetteville. Always something different, entertaining, and unique! Great Drinks, too! Artist and educator Joel Armstrong will feature two series of rust-related artworks throughout the month of September at Stage Eighteen. Join us for a free opening reception held during First Thursday from 5-9pm on the evening of September 7. Joel's work is a culmination of his practice, influenced by his education, personal experiences, readings, and world history. 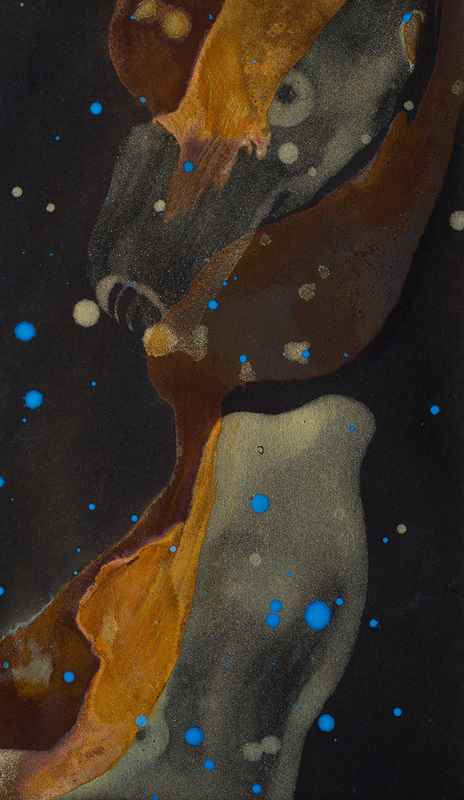 He highlights both rust and gold, examining rust as a force that can wear down strong materials, while gold harkens to renewal and continued enriching experiences. All artworks will be for sale at various price points. My installations have always based on stories. Whether these stories were from personal memories of growing up, family history, or those shared with me—stories led my artwork. There was safety in those stories, and if a viewer dug deep enough or long enough, they could always find the clues to understanding my work. In a way, the wire pieces mirrored the originals in the form of rust paintings. I attended a workshop called "100 Drawings" in Bennington, Vermont lead by Dean Nimmer. 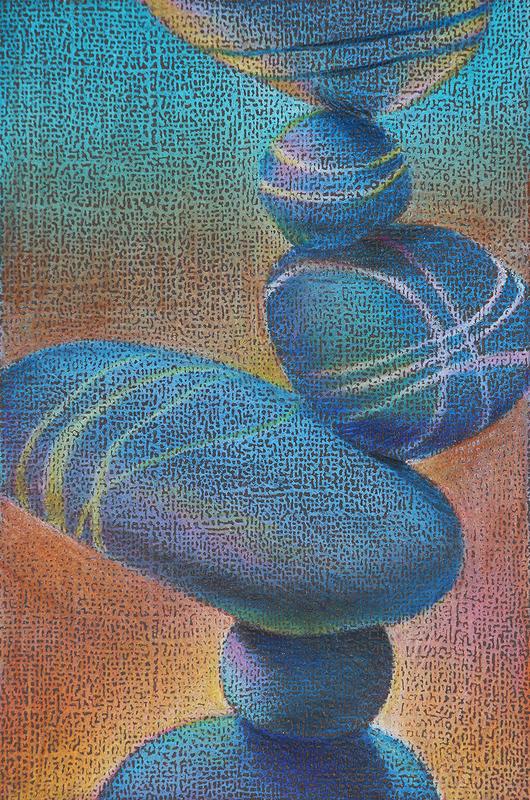 The workshop focused on allowing intuition to guide your artwork, rather than relying so much on a plan for completion. I brought with me my traditional rust patina that I was so comfortable with; however, I didn't allow myself to take along the wire which was so much the base of all my work for so many years. I also semi-intuitively brought along a gold glaze paint. 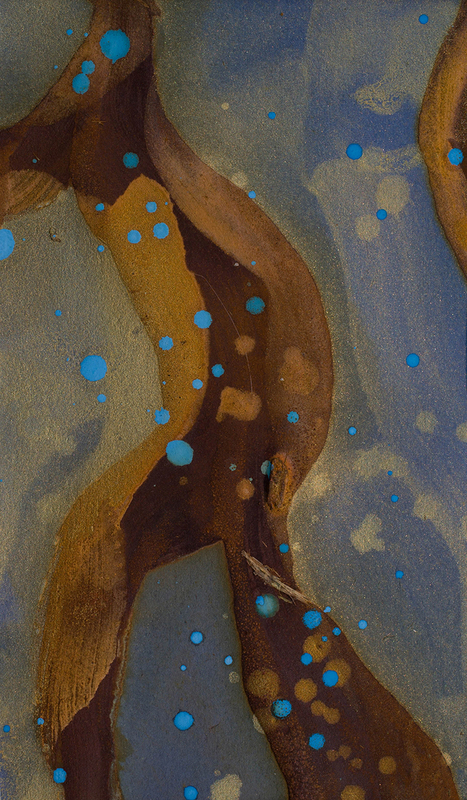 Working on three different colored art papers, I began making intuitive marks first with the rust, then gold, and finally a beautiful contrasting blue. The gold proved to be a startling contrast to rust, both in reality and also in theory. The old was being made new again, as the decay of rust was being overtaken and simultaneously enriched by the shimmering gold. The combination of the gold and bright blue made these works come alive in such a way that one might easily imagine how gold and rich colored fabrics filled old world tapestries. 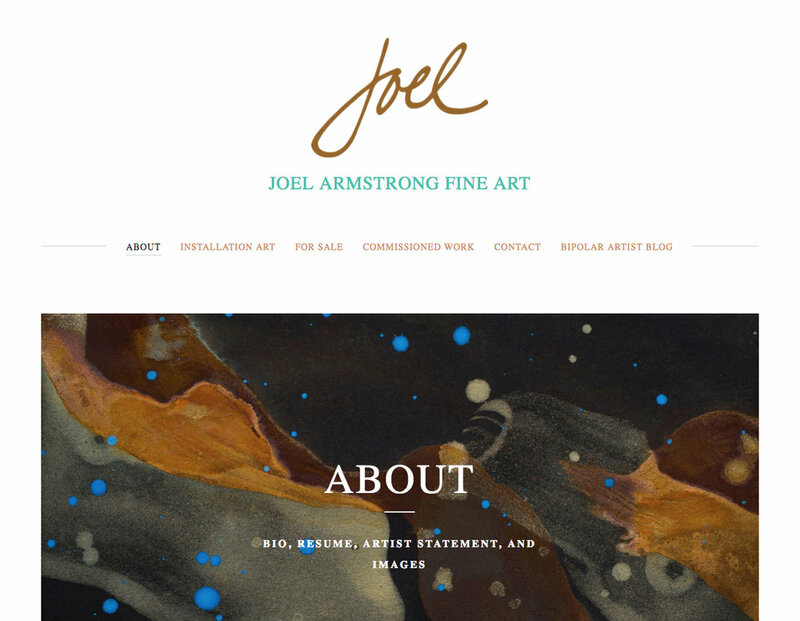 Joel Armstrong grew up in Corpus Christi, TX, where he grew to love fishing, salt air, humidity, and rust. After attending Texas Tech University, he spent over 20 years as an illustrator and graphic designer. 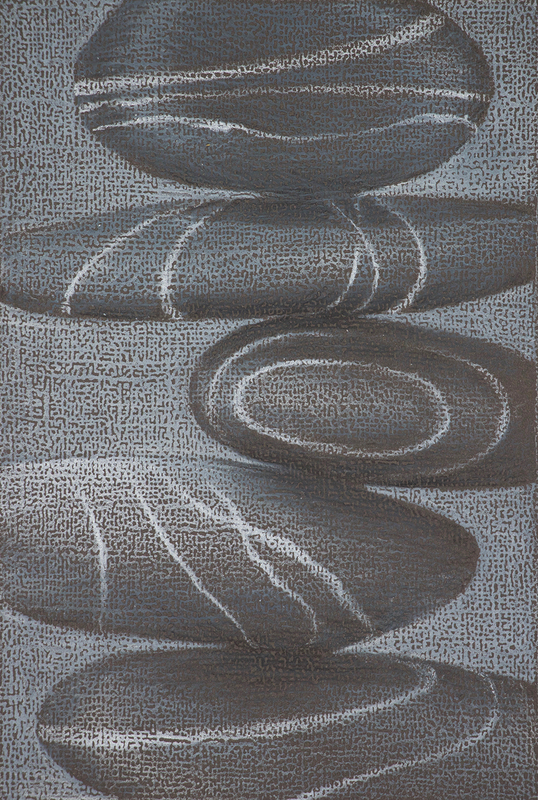 Armstrong received his MFA in drawing from Colorado State University in 2001. 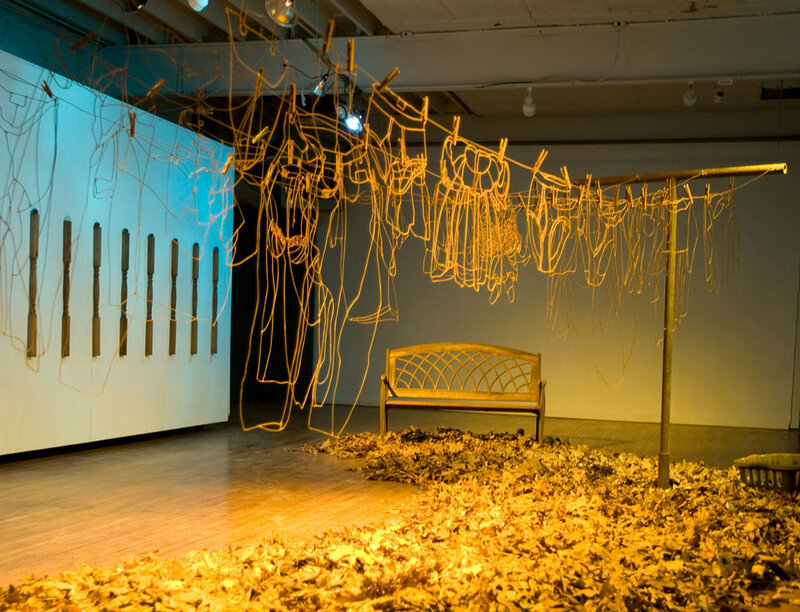 At CSU, he began working with rusted wire. Recently, Armstrong has started working with nickel/silver wire, rust and gold paintings, as well as aluminum public art pieces. The artist currently teaches drawing and illustration at John Brown University in Siloam Springs, Arkansas. Joel Armstrong has been working with wire as a medium for over 20 years. He has kept the work flat to keep it from being sculpture. His current work takes pride in classic art pieces, giving them his own flair. An attempt to see if I can still draw the figure, Yeah! The story line is simple: we have Modesty attempting to cover the new-born nakedness of Beauty, while the god Zephyr (perhaps with a reconciled Chloris in tow?) attempts to prevent this tragedy from coming to pass. David entwined in vine...Revised, July 11, 2017. I kept thinking the there needed to be more ivy. And I was right. 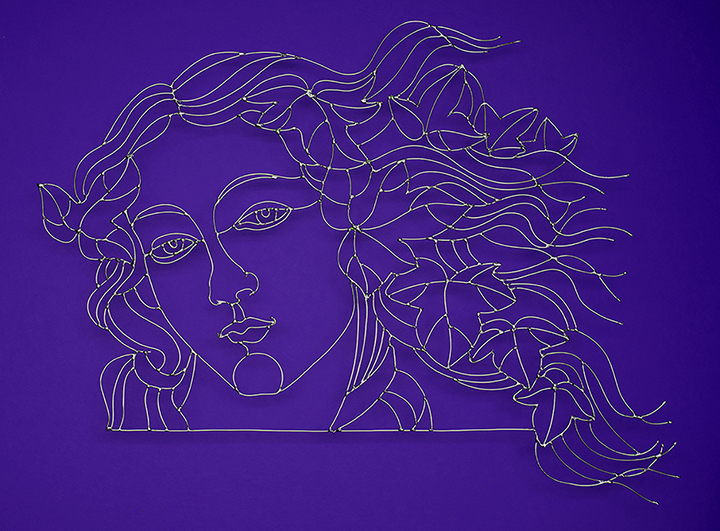 New wire piece, influenced by Statue of David, from our Italy trip. Spent two weeks in Italy, and 4 weeks in Ireland. Had a blast. David was very impressive, as was the entire trip. My Wire Iris #2 won "Best of Show" in the "All Botanical" 3D and Mixed Media competition. Assemblage and collage work was recently accepted into the "Collaboration and Mixed Media Exhibition"
Renowned collage Artist Cory Peeke and I did several collaborations together, combining my assemblage skills with his beautiful collage work. One of those pieces was accepted into the 3rd Annual Collaborations and Mixed Media Exhibition, March 18, 2017 to April 22, 2017, at the The Gallery at Center for Creative Education in West Palm Beach, FL. Video from my Rust and Gold opening, at JBU gallery.